A business woman portrait at Moderene Living Furniture store in Chicago. I recently spent the day taking Creative Professional Business Portraits for Elizabeth, an entrepreneur and business woman in downtown Chicago. She will be using these images for her various ventures because she knows that professional images are a must for any business person, creative or even a 9 to 5 worker. We started our session at The Peninsula, a luxury hotel in the heart of downtown Chicago. They are host to many events and weddings with their glorious ballroom and lovely terrace. A Chicago business woman shows off her lovely dress inside the ballroom of The Peninsula Chicago. We wanted to show off the many sides of Elizabeth, from playful to woman at the boardroom, all the while showing off her beautiful clothing and stunning femininity. A portrait session inside The Peninsula in Chicago. The grand staircase at The Peninsula, a luxury hotel in Chicago. We transitioned from the wonderful scenery inside to doing outdoor portraits on the famed terrace. The Peninsula terrace has a terrific, flowery and colorful landscaping as well as a great view of Chicago skyscrapers such as the John Hancock tower. Business portraits for a creative professional in Chicago. Portrait overlooking the city of Chicago from the terrace of The Peninsula Hotel. We finished up our session at Moderne Living, an upscale store featuring modern European and Italian furniture. A business woman portrait at Moderne Living furniture store in downtown Chicago. I hope you have enjoyed this look at business professional portraits in downtown Chicago. To book your session, please fill out the Contact Form today. For wedding photography, please visit my sister site Region Weddings. A lifestyle portrait at the piano just outside the ballroom of The Peninsula in Chicago. Studio photography in Crown Point, Indiana. I'm very happy to announce that after eight months of downtime the studio is now open again. In early 2015 heavy rains came through and water ruined the flooring making the studio inoperable. This happened just as my wedding season kicked off and I was unable to find the time to install new flooring until this winter. Everything is in place now and it looks better than ever. 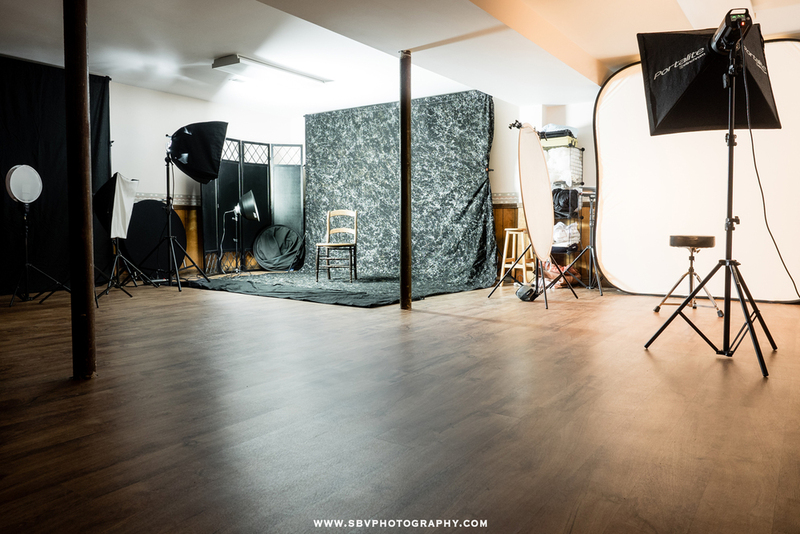 From the images above, you can see that many styles are possible in the studio - from intimate portraits such as boudoir and maternity photos to business head shots and senior pictures. The studio itself is quite large with several shooting areas. There is a spacious and private changing room for outfit changes and a bathroom as well. It's a laid back atmosphere with music and we always have a good time no matter what we are shooting. Portrait studio in Northwest Indiana. I can't wait to start booking studio photography sessions again. Please fill out the Contact Form and let's get you down here and knock out some awesome portraits! !